This post will be a bit all over the place...just forewarning you, actually it reflects how my life is at the moment. As I am finishing up at my school I am moving all my resources and bits and pieces out of my classroom and we all know that means I have to find somewhere at home to store it, tricky. I only started my Christmas shopping on the weekend and really don't know what I have and haven't got......I know I have forgotten someone. In the middle of this I am still trying to undertake some meaningful learning that has a Christmas/holiday twist. Now last week I gave my students a paper chain challenge, when I was a primary school student I remember making these looooonnnngg paper chains and I loved it! So I put my kiddos into teams of 4 and gave them 15 minutes to create a paper chain (using magazines and junk mail catalogues) as long as they could, I asked them to really think about how they would cut their paper to ensure it would be longer and allowed them some discussion before they started. Some of the discussion was interesting, one group debated how to cut the page another group decided they would cut strips of paper until there was 10 minutes left and then they would start the chain. When 15 minutes were up they were allowed to join the 4 chains together. If they had created any links that were a teardrop shape instead of a circle it was disqualified (we didn't have any disqualified). We then went to measure each paper chain, recorded the length and the team with the longest chain won a prize from my prize box. The longest chain was 9.00 metres (29.5 feet). This was the first time some of my kiddos had used a trundle wheel, what fun! I put the measurements on the whiteboard and then the students had to estimate how long the chain would be if we joined them together, the student that got the closest (using only mental computation) got a prize. In the afternoon we went out and measured how long our paper chain would be if we laid it out, it was 46.25 metres (151.74 feet). The students had such a great time and the co-operative learning that was happening was so great to see! At the end all the students got a prize for showing co-operation and a love for learning. 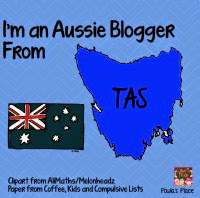 So to finish this post I want to share a giveaway that my friend Alison at Teaching Maths with Meaning is having. 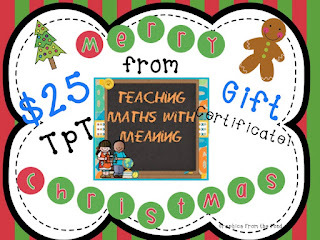 Hop on over to visit and enter for the chance to win a $25 TpT gift voucher. Finally I wanted to say a big thank you to Michelle at 3am Teacher and Farley at Oh Boy 3rd Grade for organising the Silence for Sandy Hook Elementary on Sunday. It brought me to tears to see all those hearts in my feed and I continue to hold those little ones and their families in my thoughts and hope that soon they will begin to heal. Thanks for the shout out Tania! The Paper Chain Challenge sounds fantastic! Especially the use of recycled materials! What a great way to practice measurement!